L. Domitius Alexander was the Prefect of Africa who led a revolt in 308AD against the tyranny of the Italian usurper Maxentius in North Africa. Maxentius’ position was unanimously declared illegal by the Tetrarchy at the Carnuntum Congress, where they also declared him to be a public enemy. Maxentius’ territory was bordered by the territories of Constantine the Great and Licinius. The illegal status of Maxentius gave hope to the outlying provinces to stage a rebellion of their own against Rome where Maxentius had taken control. The North Africans had been attached to Maxentius’ cause only because of their loyalty to Maximian, and once the rift occurred between father and son, they quickly set up their own Emperor, L. Domitius Alexander. The usurper was able to maintain his independence for about three years and even entered into alliance negotiations with Constantine. After a brief reign of 3 years, Maxentius was forced to march against Alexander due to the fact that the corn supply to Rome from Egypt had been cut off causing famine in Rome itself. 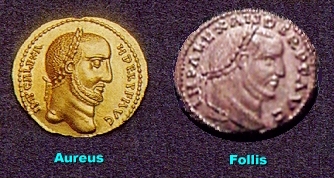 Maxentius sent Rufus Volusianus, the Prefect of the Guard, to Africa with several cohorts of Praetorians. 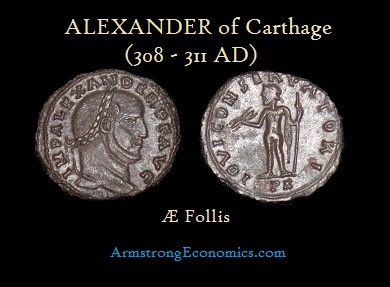 Alexander was subsequently executed (strangled) in 311AD at the city of his rule – Carthage. Rome once again destroyed the city of Carthage with the typical style of ruthless suppression, which had been the trademark of Maxentius. Eventually, the tyranny of Maxentius was ended with his defeat at the hand of Constantine the Great ushering in a new age of Christianity. The mint of Carthage was shut down as the result of the defeat of Alexander. This was often the case when a city revolted against the central authority. However, Constantine reopened the mint after his victory in 312.